We lost an American pioneer and revolutionary when Lee Glaze died recently. I had the privilege to attend his memorial at Triangle Square, LA’s gay senior housing center. Among the assembled crowd I was definitely the youngest there, which made me a little sadder than I already was. There should have been thousands of people there. The altar, made from a draped folding table, should have collapsed under the weight of flowers twisted into wreathes. We should have filled his apartment with roses, from floor to ceiling. Better yet, since he is no longer here to witness such tributes, we should have done more while he was still alive to let him know how appreciative the world really is of what he accomplished. The world should have been more appreciative. We know so little about our history. We’ve selected a few bright stars and moments to put in our pantheon, Stonewall, Harvey Milk etc., and left the rest unilluminated. There is so much more to gay history, so many more hands at work behind the scenes. Lee Glaze, the owner of The Patch, a gay bar in Long Beach, stood up the police a year before Stonewall. When patrons of his establishment were arrested in a raid, he marched down to the station with followers holding flowers and demanded their release. “We’re here to get our Sisters out,” Lee told them. There is so much that the youth of the community takes for granted. Every visit to West Hollywood reminds me that the joy of drinking vodka cocktails to a soundtrack of house music with tons of boys relies on the hard work of our elders. Maybe only gay history themed cocktails would bridge the divide. I’m not counting myself out of the blame game. I don’t have the means to buy out the floral district but I could have visited him more, treated myself to more of his company. I even came a little late to the service, having come straight from work. All that despite my awareness of what a mensch he was. So I can’t hold it against those who don’t know better, who are ignorant of his legacy, for not providing more for him. I met Lee Glaze, thanks to my involvement with the Sisters of Perpetual Indulgence. A social service organization with a structure resembling a nunnery, we have a tradition of sainting important and helpful individuals. A couple of years ago we bestowed the honor of Sainthood on Lee Glaze. 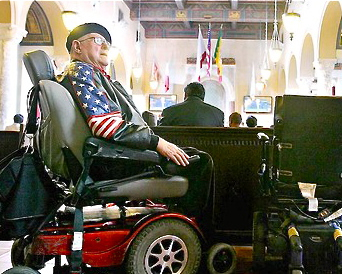 At the ceremony, people spoke to the immense impact his choices had, we blessed him and bound him to his wheel chair with ropes representing his ties to the community. After one of his hospital stays I helped clean his apartment with the help of a few of my fellow nuns. He had a lot of stuff and a beautiful painted bathroom that he had done himself. As we worked he regaled us with stories from his life. I remember him telling us about being the first manager of the first branch of Taco Bell for instance. He had strong opinions about life, his living situation, his city and the world. He cussed out a home health aide that wanted to change his bandages because it had hurt so much the last time. The word “shy” and Lee Glaze share no relation. At his memorial, he was summed up as someone who was difficult at times, a little crazy, very talkative and kind. Despite his outsized personality and outspoken spirit, he was able to be gentle when necessary. This is a man after all who brought the police hundreds of flowers in protest. He was described as a personal embodiment of Gay Pride. Thank you Lee for all that you did. Rest in Peace and Power. extremely well written, my Sister. Please write more, especially what you remember of what Lee told you of our history?